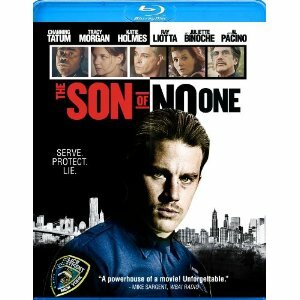 The Son of No One is complex in its attempt to connect its storyline together. This complexity is not intelligent and thought-provoking as much as it merely seems unbelievably coincidental. This makes for a strained viewing experience, and perhaps the reason that this film slipped below the radar of most film goers. Audiences don’t seem to mind unrealistic coincidences in comedies, especially when it comes to romance. But when these coincidences bring about sadness and misery instead of kismet, audiences tend to revolt. The unfortunate happenstance begins with an accident involving children in a Queens projects building. A man double homicide brings in a homicide detective (Al Pacino), who coincidentally has ties to one of the children involved. This child is given a pass because of his ties to law enforcement, and he grows to become a second generation cop. Jonathan (Channing Tatum) has put his past behind him, until he is assigned a beat in his old neighborhood and the double homicide he was involved in becomes reopened. With an anonymous source leaking hints at a police cover-up and a reporter (Juliette Binoche) who just happens to be interested in a decade-old homicide in the projects, the old case nobody cares about becomes a huge source of drama in the department. Jonathan is forced to track down his childhood friends (with a powerful supporting performance by Tracy Morgan), in a desperate attempt to stop the situation from escalating. The Blu-ray release of this brutally depressing police thriller includes an audio commentary with writer/producer/director Dito Montiel and executive producer/editor Jake Pushinsky. There are also a few deleted scenes, though the film already seems a bit too long at 94 minutes. The high definition also adds little to this average, albeit easily forgettable cop drama.